There won’t be too many managers plying their trade in the lower echelons of the football league structure that can lay claim to having faced Brazil, but new Clitheroe FC boss Simon Haworth can! The 39-year-old, appointed as Simon Garner’s successor at Shawbridge, went toe-to-toe with the reigning World Cup champions in an exhibition match at Estadio Mane Garrincha in November 1997. The former Welsh international was replaced by Adrian Williams on the hour in Brasilia as Zinho, Rodrigo and Rivaldo condemned Bobby Gould’s side to a 3-0 defeat. The likes of Claudio Taffarel and Cafu also featured in the fixture. Haworth was a huge admirer of Brazil’s scintilating “Samba” style of football and while he’s not claiming to emulate that in the Ribble Valley, the striker is promising to instil his own exciting, attacking brand. “It was an amazing experience to play against them,” he said. “I had a few chances as well which I probably should’ve scored but we were beaten 3-0 in the end. 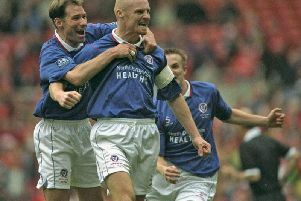 The former Wigan Athletic man, who scored the club’s first ever goal at the JJB Stadium, has got things moving by appointing Gareth Roberts as his second in command. The pair will now work together to build towards the new term in the Evo-Stik First Division North. “I’m really looking forward to it,” said Haworth. “At the moment it’s just a case of trying to speak to the lads that were involved here last season and seeing what their intentions are. “Hopefully things will start picking up pace now because they’ll have had a chance to reflect on that campaign and weigh up their options for the future. Haworth added: “I want to bring an exciting brand of football to the club. I like to see attacking football that’s balanced with discipline and organisation. That’s what you need to win games of football. There’ll be times when we’ll need to roll our sleeves up and win ugly too. “I want my players to set high standards for themselves and the club and I want them to take pride in pulling on that shirt. That’s what I’ve taken with me from being a professional. Haworth’s connections within the game and his experiences could prove invaluable at this level. He considers Everton boss Roberto Martinez as a close friend as well as Northern Ireland coach Michael O’Neill, who guided his nation to its first European Championship finals. “I’ve got a good relationship with Roberto Martinez,” he said. “He’s a good friend and I like the way he goes about things. He’s very positive and he treats people with respect. “There’s Michael O’Neill as well who I played with at Wigan. He’s a student of the game and he’s done really well. I also worked with Micky Mellon when coaching at Shrewsbury too. Meanwhile, last season’s leading scorer Sefton Gonzales has joined Conference North side Chorley. The 24-year-old, who scored 19 goals last term, earned a place in the division’s Team of the Year alongside Scott Harries.